Harris's sensitive writing and insight will give readers many moments of pleasure. Published in 1989 to wide acclaim, Come the Morning was one of the first novels for older children to treat the problem of homelessness realistically. Fifteen years later, with unemployment and poverty on the rise again and homeless families haunting the streets of all our major cities, the book remains as sobering and timely as it was in the late 1980s. Come the Morning tells the story of the Gibsons, a working-class family from El Paso, Texas, who are struggling to survive the desertion of their father. When Constance Gibson receives a money order postmarked Los Angeles from her husband Clyde, she and her oldest child, thirteen-year-old Ben, interpret it as an invitation to join Clyde in the city of dreams. Once in Los Angeles, the Gibsons encounter one ordeal after another, eventually moving them out of a frightening welfare hotel and onto the menacing streets of skid row. Throughout their harrowing struggle, Ben clings desperately to the belief that they will find Clyde, restore their family, and rebuild their lives. While Ben searches for his father, his mother tries valiantly to find them food and shelter. Stark and sparsely written, this novel is a moving account of a young man forced to measure memory and love against reason and reality. It is at once an illuminating look at the surreal lives of America’s homeless and a tribute to the strength of faith and family. The new edition of this prize-winning novel is enriched with twenty striking photographs by Marissa Roth and a new afterword and commentary by the author. Mark Jonathan Harris is a professor in the School of Cinema-Television at the University of Southern California. He is the author of many books, including Solay (Bradbury, 1993), Confessions of a Prime Time Kid (Lothrop, Lee & Shepard, 1981), and The Last Run (Lothrop, Lee & Shepard, 1981). Also a film director, he has won three Academy Awards for his documentaries, most recently in 2000 for Into the Arms of Strangers: Stories of the Kindertransport. Marissa Roth is a freelance photojournalist based in Los Angeles. She has published two books of photographs, most recently Real City: Downtown Los Angeles Inside/Out (Angel City Press, 2001). She was part of the Los Angeles Times photography staff that won the Pulitzer Prize for Best Spot News for their coverage of the 1992 Los Angeles riots. Beautifully-written, evocative and true. Harris is an immensely talented writer/director who takes us straight to the hearts and minds of homeless people, and challenges each of us to do something, anything to remove homelessness from the nation's conscience." An experienced author of contemporary fiction for children movingly addresses the problem of homeless families in stark, unsentimental style." Originally published in 1989, this edition has been updated with an Author's Commentary. Regardless of the updates, the text might be even timelier today than when first published. Since then, the population of homeless families has swelled, and as Harris notes in his Afterword, 'Today the fastest-growing segment of the homeless is children.'" Like Adrienne Jones' Street Family, Come the Morning chronicles the lives of the homeless in Los Angeles. This time, however, the subjects are a mother and three children, ages 3, 9, and 13, who've come from El Paso in search of the husband and father who deserted them several months earlier. . . . Harris' portrayals of the Gibsons and of others who interact with them are often detailed and moving. The message is an optimistic one: hope is possible if we care about one another." 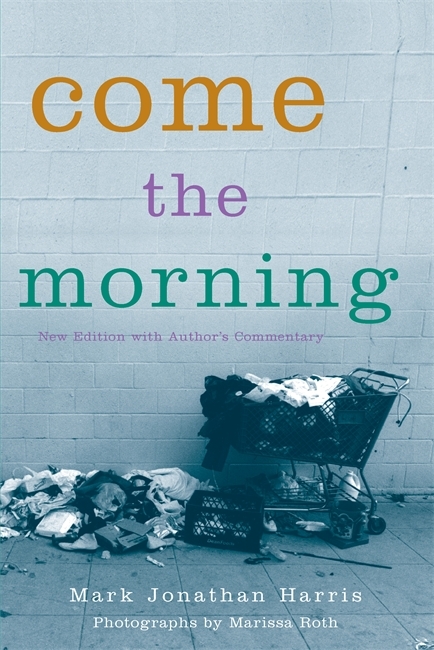 It's a challenge to steer kids over 12 to books you'd like them to read-like Come the Morning by Mark Jonathan Harris, a novel that successfully tackles a tough subject: homelessness. . . .The story is told with gritty realism that does allow a glimmer of hope-but not much more than that-at the end. Harris is to be applauded for his effort; he doesn't flinch, although the reader will. And should." This story of a homeless family, all too common and tragic, is told thoughtfully, and while the events are somber and frightening, Harris's sensitive writing and insight will give readers many moments of pleasure."